Heat oven to 350°F. Remove 1/2 cup cookie dough from roll; wrap in plastic wrap and refrigerate for another use. 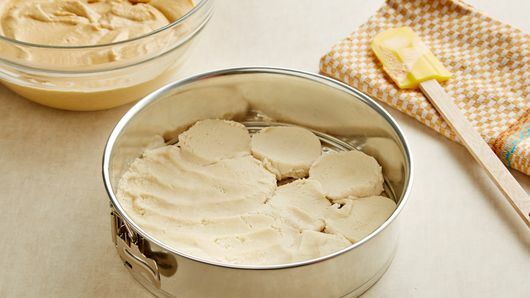 Cut remaining cookie dough into 3/4-inch slices; press in bottom and 1/2 inch up sides of ungreased 9-inch springform pan. In medium bowl, beat cream cheese and sugar with electric mixer on low speed just until smooth and creamy; do not overbeat. Beat in eggs just until blended. Add pumpkin and pumpkin pie spice; beat on low speed just until blended. 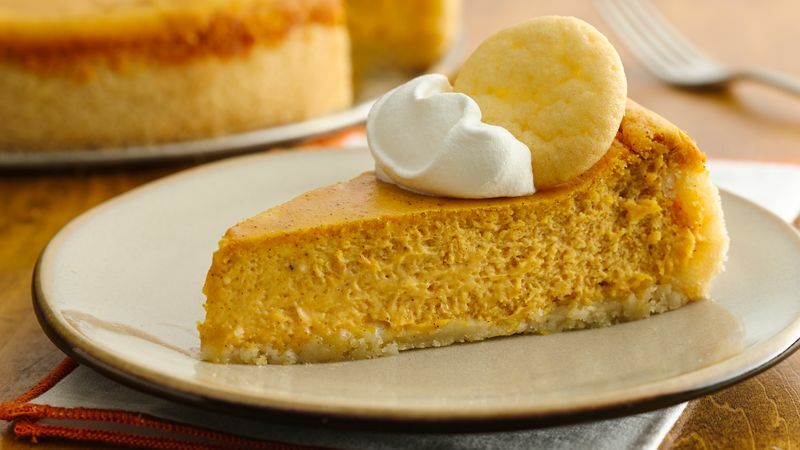 Pour into cookie crust, spreading to cover edge of crust. Bake 42 to 46 minutes or until center is set. Cool 1 hour; run knife carefully around side of pan. Refrigerate at least 2 hours until chilled. To serve, top each slice with a dollop of whipped topping. Sprinkle whipped topping with additional pumpkin pie spice, if desired. Use leftover cookie dough to make small cookies to use as a garnish. For each cookie, shape 1/2 teaspoon dough into ball; place on ungreased cookie sheet. Bake at 350°F 6 to 8 minutes or until edges are very light golden brown. Cool 1 minute before removing from cookie sheet. 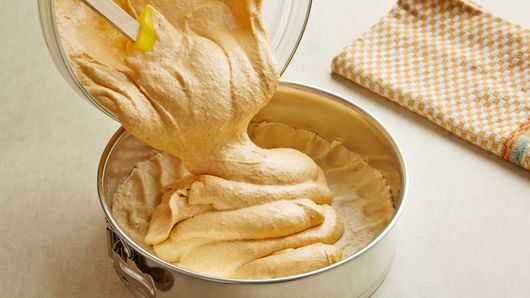 Place one cookie in each dollop of whipped cream. You can sprinkle a few chopped pecans on the whipped topping, and omit the cookie garnish. Use the remaining dough to bake cookies as directed on package. If you don’t have pumpkin pie spice, you can use 1 1/4 teaspoons ground cinnamon, 3/4 teaspoon ground ginger and 1/4 teaspoon ground nutmeg.